I’m supposed to be at a holiday party right now. But, I can’t go until I process a few things first. I have to write, for hope and for healing. There is no making merry until that happens. For many, there is no making merry at all this year. Who is this introvert I’ve become? I don’t know. Maybe it’s just that my heart bleeds a bit more these days. It bled a lot these last 24 hours. Yesterday at school, I found out one of my students is the victim of verbal abuse, gang violence, and domestic disturbances. Her home is literally a war zone. As a result, she has speech impediments and no place to study. She is 17. Lord, have mercy. Last night, as my community group passed out gifts boxes to needy families, a 5-year-old girl told one of my friends that she wants a robe and slippers for Christmas. Strange request from a small child. The reason? “So I won’t be cold at night.” Tonight, the low will drop down to 39 degrees, almost freezing. If her family cannot afford warmer clothing or to run the heat, she may well also go to bed hungry. Lord, have mercy. Today, by 10 am, I heard that 20 children died, unthinkably, at the hands of a deranged shooter. Untold presents sitting under Connecticut Christmas trees, with 20 children’s names on them, will go unwrapped, forever. Pairs of 20 parents will make an unutterably painful trip back to Toys R Us’s and Targets and return gifts for the children who will never be returned to them. I weep as I write this. I am not a parent, and still this is pain unimaginable to me. Christmas cards magneted on refrigerators this year contain photos of precious faces and smiles that will not be captured in the cards to come. Those gaps will never be filled. Oh, Lord, have mercy. These are the kinds of days when believers everywhere pray, “Lord, have mercy,” followed quickly by “Oh, Lord Jesus, come quickly.” And therein lies the only Hope. Because He came 2000 years ago, He will come again and He will redeem this sorrow. And lest we forget, Jesus was one of the brokenhearted. He was born poor, cold, and probably hungry, in a trough for animals. His mother, watched as her son was tortured and killed on a tree (oh, the power of the tree at this time of year). She buried her chid, too. And He was victim to more pain, violence, and agonizing sorrow than any of us will ever know because He took not only His own pain, but also all of ours on that Easter Tree: the student with cruel parents, the little girl with no warm clothes, and the parents who will bury their children this week, and all the hurts of the world. He took it because He chose it. This is grace far more unfathomable than evil. And so, Lord, have mercy. May your grace and your goodness, in its power and might, outshine even the blackest of nights. May we remember the Child you sent, the one who was the least among us, not by nature nor by nurture, but by Divine Love, born to make us great. May we be people who, although we walk in darkness, have seen a great Light, and follow it to the place where salvation awaits. In every lost child’s face, may we see the Christ child, who holds them, and longs to hold us, in His tiny, but powerful fist. This entry was posted in Uncategorized on December 14, 2012 by Becka. So, is this what the joy of the Lord feels like? Let me walk you through my last 24 hours. After a particularly difficult week, the kind where the phantom pains shoot up after the initial shock of the amputation has worn off slightly, there was some balm found in Gilead. It started yesterday, in 5th period, with the fail lesson that was a win. This entry was posted in Uncategorized on December 6, 2012 by Becka. 5th period didn’t go anything like I planned. In terms of curriculum, what a fail. We were supposed to read this scholarly article after this super thought-provoking quote that the kids “quick-wrote” on. Then, on to reading the slave narrative by Frederick Douglas. We got to the quickwrite and we got to slavery, but there was no picking cotton in the fields of a white massah in the antebellum South. I made what I thought was a rather unremarkable comment, but apparently it revolutionized the world of my otherwise apathetic and educationally unmotivated 5th period. Mouths dropped. Voices expressed shock and disbelief. I mirrored their shock as I equally disbelieved their ignorance in this matter. What followed was a long conversation that took me back somewhere to tears in an orphanage in Ukraine, and the story of a girl named Natasha (who was never a slave at all, just a girl who experienced too much pain), and the plight of slaves here in Riverside, in Irvine, in Uganda, in Houston, in the Pacific Rim, in… well, everywhere, in short. Ah, so it turns out my kids aren’t so apathetic after all. Maybe I’m the cold-hearted one. Maybe I stopped believing, in them, in the very mantra that I repeat over and over from Thoreau: “It matters not how small the beginning may seem to be. What is once well done, is done forever.” Maybe I totally discounted how small the beginning of change can be, even in 5th period. Sure, maybe my kids could care less about literature, but they care a whole lot about people. And in a world where grades should define us less, and love more, I will take this heart any day over a roster full of A+ papers. I’m not sure I can remember the last time I had this kind of conversation with a group of students, and today, it came from the unlikeliest of places. Isn’t that always the way? And so, this afternoon’s lesson gone awry was tonight’s eucharisteo of thanksgiving. This entry was posted in Uncategorized on December 5, 2012 by Becka. If you’re reading this, let me just first start off by telling you, I have no answers. There are no answers. Stop reading if that’s what you want. Whenever I write my first book, this is how I imagine I’ll begin it. A caution to the reader, a word from my wisdom, a truth perhaps greater than any other I’ve learned in my twenties. It took me eight years to learn that lesson. Eight years. And what took eight years to learn, actually, took only moments to realize. Sometimes, God answers prayers in a few weeks that our hearts have been searching for for years. And sometimes, prayers get answered, but there’s still no answers. Instead, there are just these murmurings, these faint whispers that come and go as imperceptibly, as swiftly, as softly as a light breeze that flirts with skin for a moment, and leaves your senses heightened, awakened, desperate for more. Sometimes they come in the soft chocolate down of the fur on your puppy as your bury your face in her still rolly neck. Sometimes they come in the air that cools sweat beads as you run, almost in flight, staring into a tableau sunset. Sometimes they come in a strange, ghostlike sense of peace that you try to hold onto like a melting snowflake. Sometimes they come in unexpected ice cream sundaes, crunchy heath bar tempered and softened by sweet caramel. Sometimes, they come in words and phrases, the beautiful blend of thoughts concretized into patterns of syllables and letters that carry greater depth than you trust your own voice could ever utter. This entry was posted in Uncategorized on November 27, 2012 by Becka. In my innocent 18 years of age, I thought pride seemed like the loftier answer. Satan fell because of his pride, Eve ate the apple because of her pride, and Solomon cautions us in Proverbs that “pride cometh before a fall.” In my own life, I saw a lot of wrong-doing coming as a result of putting myself on the throne, and not God. But, as I’ve gotten older, aging like a fine wine these days, it seems the heart that struggles to be obedient most often struggles with unbelief, or at least my heart does anyways. And this unbelief, if allowed to grow untempered, not unlike it’s sister sin pride, only grows greater and greater. I find myself these days with lack of faith the size of a mustard seed, a mustard seed powerful enough to stop the mountain from moving that God wants to move. Apparently, unbelief can be just as great a deterrent to action as faith can be a propellent. In Mark 9:16-25, a man brings his demon possessed son to Jesus for healing. Jesus is frustrated that the disciples couldn’t exercise the demon, apparently because of their lack of faith. The father, longing to see his son no longer tortured honestly says to Jesus, “But if you can do anything, have compassion on us and help us.” You can almost sense the desperate urgency in the broken father’s voice. And you can hear Jesus’s perceptible frustration with everyone’s apparent lack of faith. “If I can do anything? IF? CAN? Man, do you know who I am? I am the Alpha and Omega, the bright and morning star, I am the Prince of Peace, Wonderful Counselor, Lord of Lords, Good Shepherd, the Way, the Truth, and the Life, I am I AM!” Ok, that’s what I think Jesus WANTED to say to the anxious father. What he said instead was ever so much more gracious, of course, “‘If you can!’ (see I got that part right) and… “All things are possible for one who believes.” And now, for my part, oh to have the “immediacy” with which the father springs up and says, “I believe; help my unbelief!” This is an end in and of itself. How to get more faith? Ask Jesus to help me overcome my lack, to trade in my mustard seed of unbelief for the one full of belief. 1.) Are more than enough for me right now. I don’t need to worry about what will be needed 5 months or even 5 weeks from now. You just want to give me all of You, in exchange for all of Me, today. 2.) Have limitless love. I need not fear to ask You for things, thinking You have enough to worry about what with the Middle East, Africa, and North Korea. If You are capable of healing the world and caring for the “big problems,” You are more than capable of also attending to my much smaller needs. 3.) Love me unconditionally and I can do no thing that will make You love me more or less. Your blessings are separate from Your love and I need not measure Your love for me by the blessings I may or may not be able to see. 4.) Want to and CAN heal me of the anger, bitterness, and envy that every day struggles to find its way out of my heart and into my speech and actions, like bad food threatening to spew forth from the esophagus. You can reach your hand into my heart, pull out all of the ugly, and fill me with joy instead so it’s no longer even there to rise to the surface. This entry was posted in Uncategorized on November 25, 2012 by Becka. I woke up this morning with a message of hope. Ironically, it stemmed from another’s pain. Please don’t think me a heartless sadist. Let me explain. The message of hope came in the form of eucharisteo, of course. A friend from the past shared with me that in the midst of her pain and anger, my writing was giving her encouragement, and blessing her with words she herself needed to hear. My pain, shared, was bringing hope to her pain, that she now shared with me. You see, this summer, someone dear to me was vulnerable enough to share with me some art they created. The art, illustrative, not written, evidenced great pain and loss. The tears and bitterness seemed etched into the charcoal and pencil sketchings. My own heart, innocent of such pain and loss, was confused and somewhat terrified by what it saw. I could not comprehend it. Really, I just couldn’t. Art is best understood in empathy. Sympathy alone just will not do. Since that day, I have often thought with envy of my friend’s ability to release soul-wrenching emotions onto paper and canvas. God, can’t I have some aesthetic and cathartic release? Because, you see, while haunting, my friend’s images were beautiful. And if they were beautiful to me, how much more to God, who sees that pain and longs to heal it. And so, in my jealous prayers, asking God for some equally viable way to create beauty in pain, He reminded me of my need to write, to process through words, to align phonemes and morphemes together with these symbols we call letters and actually create thoughts, create meanings, that speak of beauty, and that can bring healing to the soul by the very images they evoke. I’ve never really been the girl who people came to with their secrets, or with their deep longings and insecurities. Maybe I’ve just never inspired that kind of confidance. And I’m not sure I could have. Hurt is best understand in empathy. Sympathy alone just will not do. But in the last several weeks, I have watched more people share stories of loss, of insecurities, of pain, of tragedy, of unmitigated suffering, of the beginnings, and the middles, and ends of healings, than I have ever been honored to hear before in my entire life. Tears have been shed from places deep within, all in an effort to connect with me, to bring me hope, or to simply, just share in the pain with me. There is some transformation happening here, in my own soul, and it’s leaking into the souls of others, and it too, is beautiful. To share in the sufferings of the brokenhearted. To weep with those who weep, and to mourn with those who mourn. That is why Christ gave us each other. That is how we better understand Him, and humanity, and His powerful hope of redemption. If I cannot experience some small piece of what it means to understand pain, then I have not lived, then I am not fully human. Dear Jesus, there is sweetness in sharing in your suffering and the suffering of others. Thank you for this pain that unites me to you, to my fellow wanderers, your children, those waiting still to see your goodness in the land of the living. Hope is best understood in empathy. Sympathy alone just will not do. This entry was posted in Uncategorized on November 21, 2012 by Becka. I am so thankful for friends who listen. Somehow, in every season I am in, God provides for me just the friends I need. Tonight, I was blessed to sit across tables of coffee, and chips and salsa, and pour my heart out to people who just wanted to let me gush all my angst, and processing, and my contradictory spiritual existentialism. To be honest, I felt selfish. And I felt bad. I felt like a burden. I hate to be “that girl” who’s having another breakdown. I don’t even know when I became that girl, because I feel like I’ve been her for so long now. But, bless, bless the two hearts who noticed I am not ok, and asked me to coffee and to dinner just to let me be that girl. Bless my high school English teacher who told me tonight, “Becka, it’s ok to be in the middle of Good Friday. But, just remember, we are people of the resurrection.” She reminded me that the disciples didn’t know Sunday was coming. They felt all the pain of their loss. They buried Jesus. They buried Him. But, we know, we know, on Good Friday, that while the world goes dark for three days, it will rise on Sunday with light and hope never known before. Because, we, we have the privilege of being the people of the resurrection. Bless my grad school friend who asked me tonight, “Becka, have you asked God whether or not He wants you to hope for that [thing that will remain mentionless here, for now]?” My dear friend challenged me to, instead of asking God to show me if my hope is misplaced by removing my doubt and pain if it is, to do the harder thing, and ask Him if it’s what He even wants for me at all. I don’t know how to do this. To me, asking God if a certain thing is what He wants for me implies that I may have to kill that hope if His answer is no. And I just don’t know how. But, I know that I am a person of the resurrection. And my real Hope is not dead. I don’t have to kill and bury it. May I, with greater hope and assurance than even the disciples, wait for the salvation of my Lord. He will resurrect my heart and give me what I need. Some days, the only beauty you can drudge up is the relief that comes in knowing you only have to make it 6 more hours. Then sleep can numb your mind, if he doesn’t haunt that place too. And maybe, if God is merciful, your inner self, the part that never really rests, can experience 6 hours of somnambulent non-cognitive processing of pain. Some days, the only beauty there is the release of tears running down your cheeks. Some days, the only relief in pain is a shift in pain: from your heartache to the bruises swelling around your fingers where you pounded the kitchen cabinets until you could pound them no more. Some days, eucharisteo is just being thankful those moments don’t have to be relived. This entry was posted in Uncategorized on November 15, 2012 by Becka. For my students tell me so. He used them to make me strong. 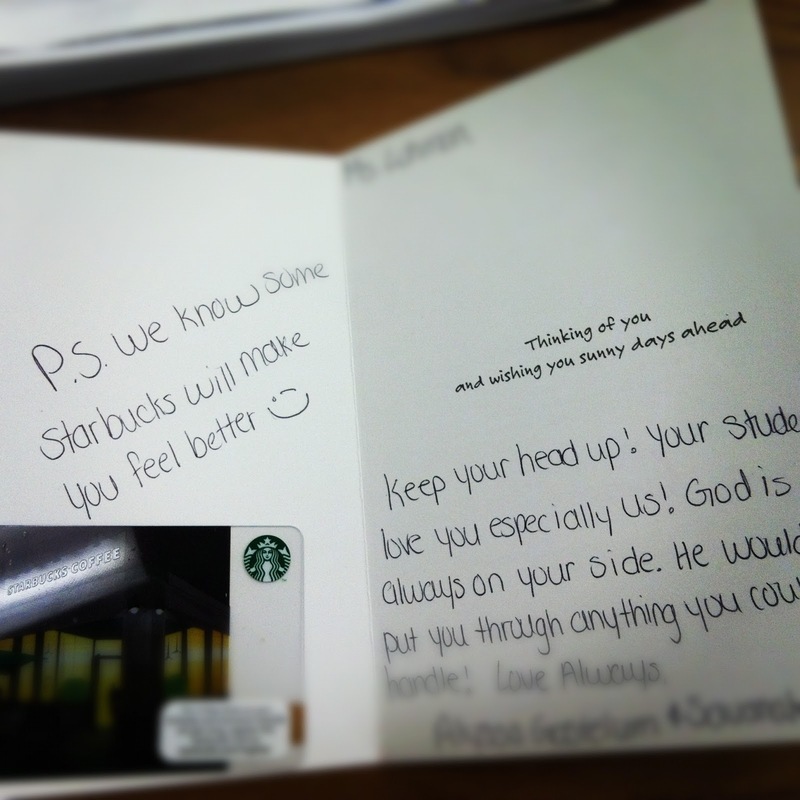 Today’s eucharisteo came in the form of one card and a Starbucks gift card, the joint product of two students, and one after work email from another. On a day that involved coming back from a long weekend, 11 hours of work, newspaper deadlines, and a lingering sense of heartache, such peace these small gestures brought me. Thank you, Jesus for your children and for the gift of getting to teach them. May they know the joy they brought me today. This entry was posted in Uncategorized on November 13, 2012 by Becka. I think I’ve decided on my second tattoo. I knew it would pick me, not I it. Like Africa. Africa picked me. And I also, knew, like Africa it would be a tattoo, that on some level, would etch pain into me (and not just the kind from the needle). I still look at my hip, and ponder the pain of when I will see Africa again, for how long, and in what capacity. I sometimes still even vaguely wonder if I missed a part of God’s plan by not going years ago. I know I for sure am “needing some of that.” These days, I find myself sitting in pain, not sure really when it will let up, but willing myself to belief that one day it will. Without sharing too much of my story, for I don’t think I’m ready to let that only recently erected barrier of self-preservation down yet, I find myself sitting in a place of pain that invites the all too well-known emotions of Anger and Bitterness to lay down and die with me on the cold, unfeeling floor. But, I’m fairly certain Anger and Bitterness only want to lay down with me so I will die, not so I will heal. And, I’m also fairly certain that the only way I can banish Anger and Bitterness from my presence is to practice inviting Joy and Thanksgiving to come sit and hold my hand on that unforgiving floor instead. There is always healing in the pain, if only we can learn to give thanks for the lessons, the beauty that can be found amongst it. I need this tattoo, not for the temporary pain it will bring, although that too will heal rather quickly, much more quickly than my torn and bleeding heart, much more quickly than my broken nature, and warped sense of comforts. I need this tattoo because when Anger and Bitterness come knocking down my door, I must remember that Thanksgiving and Joy are ready and waiting to push them back outside the walls of my heart, where they need to remain. But, I have to practice Thanksgiving and Joy. They don’t appear magically like some kind of lucky draw. Eucharisteo is hard. Pain is hard. Healing is hard. I started practicing Eucharisteo this summer, when life, like the weather, was full of warmth, promise, and easy days of rest. But, I suppose that is not truly an accurate picture of Eucharisteo. It is easy to give thanks and find joy when life readily supplies it with no fight. It is hard, but perhaps ever so much more necessary, to practice Eucharisteo when the fiend is at the backdoor. This is what I need to remember. What beauty came from Christ’s pain? The salvation of my soul. What beauty comes from childbirth? The creation of a new life. What beauty comes even from the pain of a tattoo, of art being sewn into the seams of skin itself? A lasting reminder of a memory worth keeping. What kind of beauty can come from this hard lesson God is asking me to learn? I confess, on most days I have no idea, and I wonder if it’s beauty I’ll even recognize as such. But, I recognize this, for as long as I see it merely as pain, and not as something for which I can be thankful for and rejoice in (as Peter urges us to rejoice in trials of any kind because they strengthen our faith) as long as I see it as purposeless pain, I will only see the ugly. And so, my gift today that I will choose to see came from my roommate. How wise God was to bring an old friend into the fold of our small home. Turns out, she has some of her own pain and loss that can speak into the very heart of mine. Turns out, that tears of sorrow today and pain relived from the past were what I needed to find beauty in today, and begin the process of writing my eucharisteo. This entry was posted in Uncategorized on November 10, 2012 by Becka.